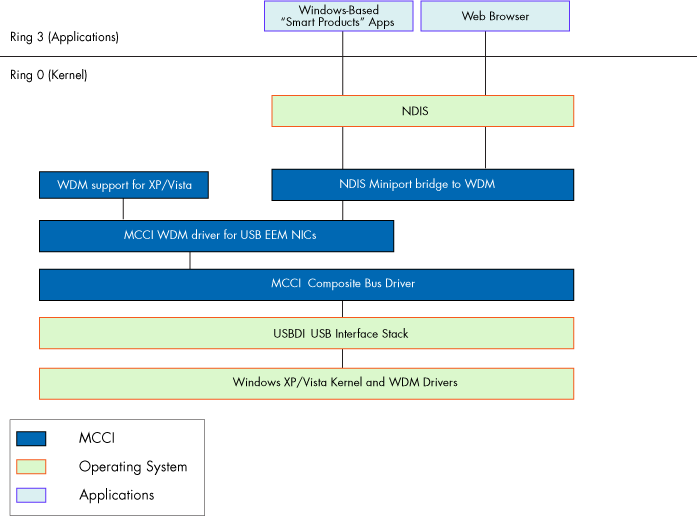 MCCI’s CDC EEM host drivers for Windows support network connectivity, product development, and system testing. Like the CDC Ethernet class, the CDC EEM class allows transport of Ethernet frames over USB. Unlike CDC Ethernet, EEM is not intended for connection to the Internet, but rather is intended for local network traffic. It also has reduced endpoint requirements compared to CDC ECM or NCM, and therefore may be more suitable for use with some USB device controllers. MCCI’s EEM drivers support Windows 7 through 10, on 32-bit and 64-bit systems. They support single function or multi-function devices. They support selective suspend when there is no network traffic to be sent in either direction. Although MCCI’s EEM support is the fastest in the industry, the EEM protocol has limited throughput when compared to other protocols such as NCM. If your product has high data throughput requirements, and you are flexible in terms of USB protocol selection, MCCI suggests you consider using NCM. More information about MCCI’s NCM products is available here.